RIO DE JANEIRO, Jun 20 2013 (IPS) - Children of a generation that fought for basic rights like having enough to eat, learning to read and being treated in safer hospitals, the over 300,000 students protesting on the streets of Brazil want more from a democratic and economic system that no longer represents them and is beginning to show its limitations. The 15-to-25-year-old demonstrators who have come out in droves in response to calls on social networks like Facebook, crowding the centres of Brazil’s major cities, are not asking for food, schools or healthcare. Nor are they only protesting against the 20 cents of a real (10 cents of a dollar) hike in São Paulo urban bus fares, where the movement got its start. The authorities announced a reversal of the public transport fare increase in São Paulo and Rio de Janeiro on Wednesday Jun. 19, and a number of other cities have followed suit. But few analysts think that this will now put an end to the anti-government protests. The demonstrators want more: better public transport that is cheap or free; better education and healthcare; less corruption; more leisure activities; and no police repression. These young people were not around during the 1964-1985 dictatorship, nor are they members of the poor masses, 40 million of whom were lifted out of poverty during a decade of government by the leftwing Workers’ Party (PT), first led by former president Luiz Inácio Lula da Silva (2003-2011) and now by President Dilma Rousseff, lightening the historic burden of inequality. Banks have suffered the protesters’ fury. More than half the population is in debt to the banks, which are among the institutions that have benefited most over the past decade. Another target was Congress, in Brasilia, where alliances are being forged that would have been inconceivable in the past, between progressive parties like the PT and old-style rightwing parties or those representing fundamentalist evangelical groups, that are opposed to laws demanded by the young. “The government has no policies for youth. It does not debate decriminalising abortion, and it opposes legalising soft drugs. Only recently has it promoted the spread of the internet, but it lacks a project for democratising the media. The young have never been a specific focus,” sociologist Emir Sader, a longtime PT activist, told IPS. “The demonstrators are protesting against corruption and complicity between forces that have a progressive image and others that are symbols of backwardness,” political scientist Williams Gonçalves, of Rio de Janeiro State University, told IPS. During the election campaign 14 years ago, when the financial world and the middle and upper classes were in a panic about the growing popularity of the PT, afraid of losing their privileges, Catholic Bishop Mauro Morelli expressed his surprise at this fear. “They don’t understand that Lula is not going to bring about a revolution, but will simply bring this country out of feudalism and into capitalism,” said the bishop, one of the creators of the “Zero Hunger” programme which pulled 28 million Brazilians out of extreme poverty. The feudalism he referred to was characterised by vast unproductive large landed estates, rural slave labour, illiteracy and urban migration, a countryside lit by candle light, mediaeval standards of sanitation and violence against landless activists by gunmen in the pay of large landowners. And this transformation was partially achieved. Since 2003, spending on healthcare increased from the equivalent of 11 billion dollars to 35 billion dollars, and on education from three billion dollars to 17 billion dollars – expenditure worth “10 World Cup tournaments,” the PT said on social networks in response to opposition accusations and complaints. 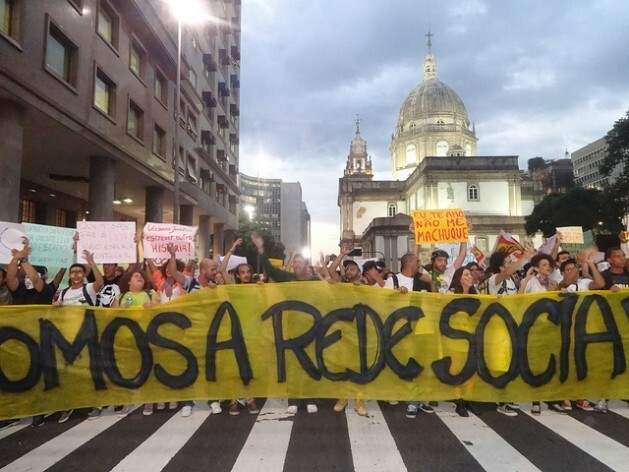 The protesters carried placards saying “Se seu filho adoecer leve ele pró estádio” (If your child is sick, take him/her to the stadium) and other slogans critical of the billions of dollars invested in preparation for the FIFA Confederations Cup, which is now being played, the FIFA World Cup in 2014 and the 2016 Olympic Games. Rural feudalism has been overcome by Bolsa Familia, which provides cash transfers, and other programmes for more than four million small farmers, although the concentration of land in the hands of a few has not yet changed. But people in both rural and urban areas are demanding more. They want access to housing loans and affordable home ownership; decent public health services in order not to have to resort to private healthcare; and an end to repression at the hands of the military police. Disproportionate crackdowns on the first protests were precisely what prompted mass turnouts at later demonstrations. “I came because of the fare increase and for our right to protest. The harsher the repression, the more people will come,” said 17-year-old Brenda de Castro, demonstrating in Rio de Janeiro. In President Rousseff’s view, “the message direct from the streets” strengthens democracy. “My government, that wants to increase access to education and health, understands that the demands of people change,” she said. “They change when we change Brazil, because we raised incomes, increased access to employment, and increased people’s access to education. This resulted in citizens who want more, and who have a right to have more,” she said. Marcelo Carreiro, a history professor at the Federal University of Rio de Janeiro, said there are a wide range of people who are discontented, but that the protesters have one thing in common: “the repudiation of the representative democratic system and of the way it has gradually distanced itself, over a long time, from public opinion. “This could properly be considered a historic moment in which, because of technology, the capacity to mobilise is no longer tied to the old structures that dominated and organised mass movements in a hierarchical way, such as political parties, trade unions and churches,” he told IPS. The demonstrations in Brazil, the largest since the 1992 protests against then president Fernando Collor, who was impeached, are expressing “discontent with the state and society in its present form,” said Augusto de Franco, an expert in social networks. “The vague feeling it expresses is outrage against old-style politics, especially against political parties, and indicates a clear rejection of the privatisation of politics,” he said. “The left has always had difficulty understanding the young, because the classical economic scheme sheds no light on its special characteristics, which cannot be reduced to social origins. It is a special period in life, open to the utopian, to rebellion, to healthy disrespect for authority, to outrage against injustice,” said Sader. The PT, which formerly defended those causes, today cannot assimilate young people’s special characteristics. “It has become a pragmatic party, making alliances with conservatives and the notoriously corrupt,” said Gonçalves. “Corruption, which has become rife in the construction of football stadiums, and the media’s war-cry about inflation triggered the wave of protests,” he said. In the weekly news magazine CartaCapital, Leonardo Avritzer said that perhaps the politics of social inclusion, “invaluable in the social mobility process,” have reached their limits. Avritzer, a sociologist at the Federal University of Minas Gerais, said the focus needs to be on improving infrastructure, from public transport to roads and bridges. “We see placards reading: ‘Do you have money to invest in the World Cup? Well, invest in teachers, then!’ so it is not that the inclusive model is exhausted, but rather that people want this model to expand,” he said. Out on the street, answers are urgently awaited. “Tropical Spring? No. It’s Brazil waking up from inertia,” said Pedro, a 24-year-old biologist, as he joined the protests.